One type of tasty meal that is available at a lot of restaurants is macaroni and cheese. This is something you can also make at home without having to use a store bought product. 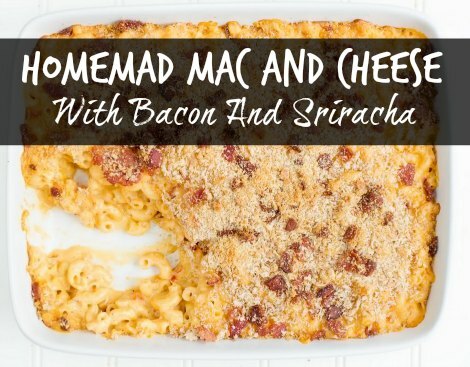 If you enjoy tasty meals, than a mac and cheese with bacon and Sriracha is a great option for a tasty dish. Many people who try to make macaroni and cheese at home often have mixed results. The main reason is not using a standard recipe and having a result that tastes bland or is too dry. There are a variety of basic recipes, but this one is exceptional. The key to making a great macaroni and cheese with bacon and Sriracha is the type of ingredients that are used. All the ingredients that are needed to make this recipe can be easily be found in your local grocery store or supermarket. The most important thing is to keep your mac and cheese with bacon really moist. If you do not use enough liquid, then the result will likely be too dry. The macaroni will actually absorb a lot of the liquid and means the soupier the better. You should use a glass pan when baking your mac and cheese with bacon. A ceramic pan is also a good option. If cheese is kept to a small amount, then the sauce for the dish will have more flavor. Your best option when making a homemade mac and cheese with bacon is to use fresh ingredients. Freshly grated cheese will be better than store bought cheese in a bag. If you want a dish that has a unique flavor, then select a smoked bacon over a regular bacon and add more Sriracha for some extra kick.